The late 15thC chapel is possibly the Chapel of the Blessed Virgin Mary. A double recess piscena circa 1500 in the south wall confirms the presence of an altar. 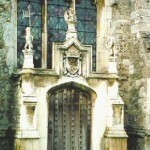 In the NW angle, a square-headed doorway leads to the rood-stairs. In the head of the south-west window is the church’s only significant fragment of medieval glass, a 15thC figure of a man in ermine robes and hat under a canopy of tabernacle work, with the name ‘SYMON’. Nearby the Tiffany window depicts the twin daughters of Consuelo Yznaga, an American of Cuban descent, and widow of the 8th Duke of Manchester. Made in New York, it is the only example in an English parish church of the work of Louis Comfort Tiffany, the celebrated glass artist. It was made in 1901. The east window, by Clayton and Bell, commemorates William Drogo Montagu, 7th Duke of Manchester, who died in 1890.Monuments to members of the Montagu family dominate the chapel. The most important of these is that of Henry, 1st Earl of Manchester, the first Montagu to live at Kimbolton Castle. Other monuments commemorate two of the five wives of Edward Montagu, 2nd earl and Civil war leader. 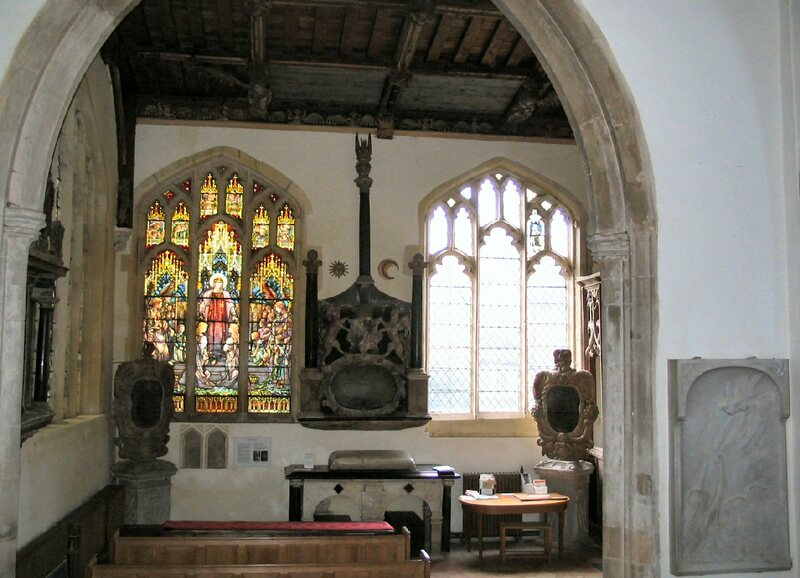 Between the south chapel and aisle is an oak screen with 15thC paintings. These show St. Anne teaching her daughter, the Blessed Virgin Mary, to read; St. Michael with a red cross on his shield, driving out the devil in the form of a dragon; St. Edmund, martyr King of East Anglia, a crowned figure in armour, holding an arrow in his hand; St. Edward the confessor in ermine robes with sceptre and ring. The screen was restored during the 19thC. Although the south arcade and aisle were first constructed in the 13thC, the aisle was rebuilt in Perpendicular style at the end of the 15thC, when the porch and chapel were added. The 15thC roof, restored in 1931, has moulded beams with carved oak bosses. At the feet of the jack-legs and intermediate principles are figures of apostles and angels and an amusing grotesque figure. 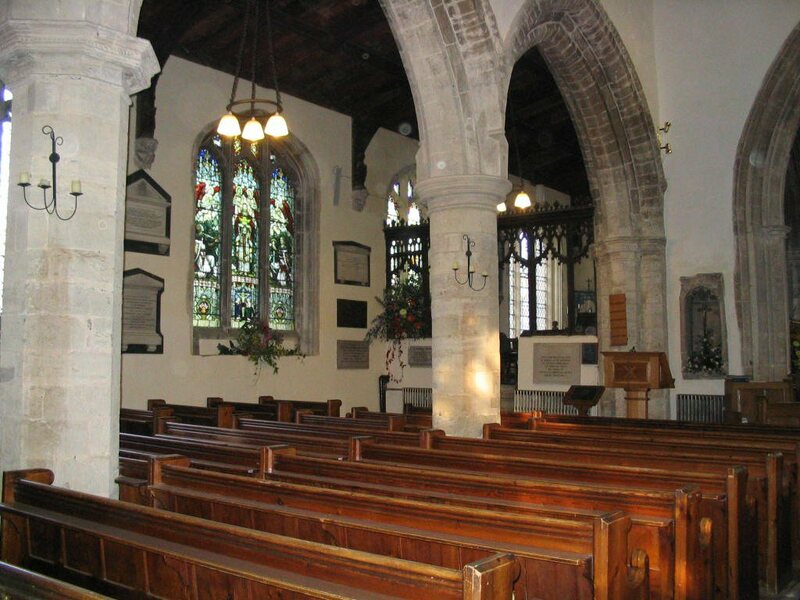 In 2004 the pew platforms in the church were all replaced and the south west corner of the church was renovated. The font was moved from here to the north aisle. 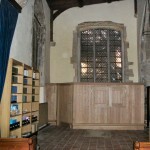 This area is now an open space and can be used to serve coffee after the morning service.In 2008 a kitchen was added to the west end of the south aisle. 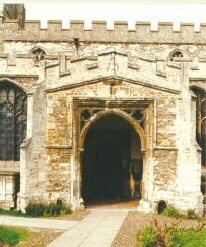 The modern roof of the South Porch retains one 15thC tie-beam above the main door. The roof is decorated with battlements, with the remains of pinnacles still visible at the corners. The late 14thC door retains a few fragments of tracery and some bullet holes, which once contained lead bullets. To the right of the door is a badly damaged 15thC water stoup. The tower was built in the early 14thC, and its exterior is divided into three stages by string courses. It is finished with a cornice ornamented with carved heads, animals, birds and an unusual fertility representation. The octagonal broach spire rises from the tower to a total height of 46metres [150ft.] The fine west doorway has ball-flower ornaments characteristic of the early 14thC. Inside the tower, on the first floor there are three panels which record Kimbolton charities [earliest 1557], these are very indistinct. The church has 6 bells. 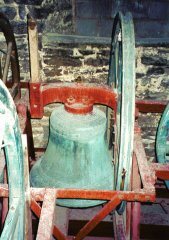 In 2002 the ringing chamber was moved up to allow for the choir vestry under the tower. 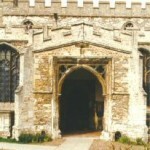 The fine oak and glass screen between the tower and the nave was erected at this time. 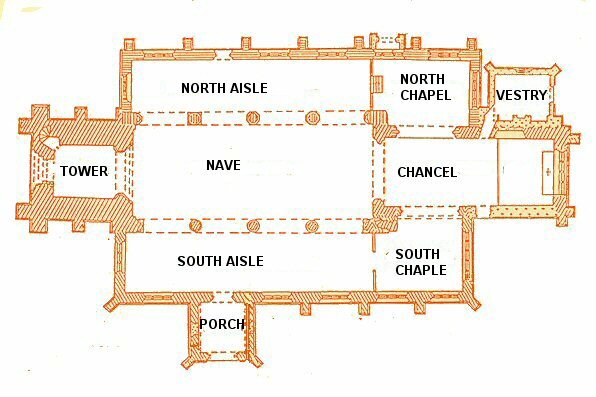 The oldest parts of the church are the nave arcades, which date from the addition of the north and south aisles in the13thC. The north arcade, possibly the earlier, has nailhead ornament and alternate round and octagonal columns. The west respond [half column] has distinctive fleur-de-lis motifs. The restored 15thC roof has moulded tie-beams, and the feet of the jack-legs rest on 14thC corbels carved with grotesque figures. Plaster on the west wall conceals marks of two earlier roofs, the steep-pitched roof which preceded the clerestory, and the original roof of the clerestory, added in about 1370.The nave was separated from the chancel by a carved wooden rood-screen, surmounted by a rood-loft with a crucifix [rood] above it, this was removed after the Reformation. The upper doorway of the rood-stairs can still be seen on the south side of the chancel arch, above the pulpit, which is a late 19thC replacement for an earlier two-tier reading desk. Hatchments: these are funeral panels bearing the coat of arms of a deceased person and were placed in front of the house or in a church. 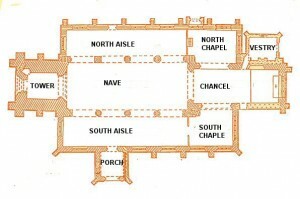 There are three on either side of the nave in the clerestory. They are of the Dukes of Manchester. If the right side is black the Duchess has died, but the Duke is alive; if the left side is black then the Duke has died but the Duchess is alive. 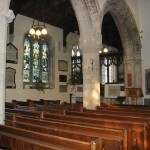 Although parts of the chancel date from 14th and 15thC, extensive restoration has left little evidence of the medieval original: there is a blocked window [circa 1300] in the north wall; the south wall was rebuilt in red brick in the18thC; the roof was replaced in 1853; and the window above the altar was destroyed by a gale and replaced about 1882. The Montagu pew backs onto the north chapel. Opposite, on the south wall, is an unusual marble memorial by René de St. Marceaux to Consuelo, Duchess of Manchester who died in 1909. The 15thC roof was restored in 1930. Against the wall-posts are carved wooden figures of saints: Philip, Peter, Simon or Jude, James, John the Evangelist and Bartholomew. At the feet of the intermediate principals are carved figures of St Michael and angels holding shields with emblems, and stone corbels carved with angels and grotesques extended into the north chapel. East of the north doorway is a water stoup with rounded head and defaced bowl. Over the north door hangs the royal arms of Queen Anne dated 1712. The practice of placing royal arms in churches originated in the reign of Henry VIII, at the time of the break with Rome. Most were removed during the Commonwealth and Protectorate, but replaced after the Restoration of Charles II. The US Airforce’s connections with Kimbolton during the 2nd World War are commemorated by a tablet near the north chapel screen. 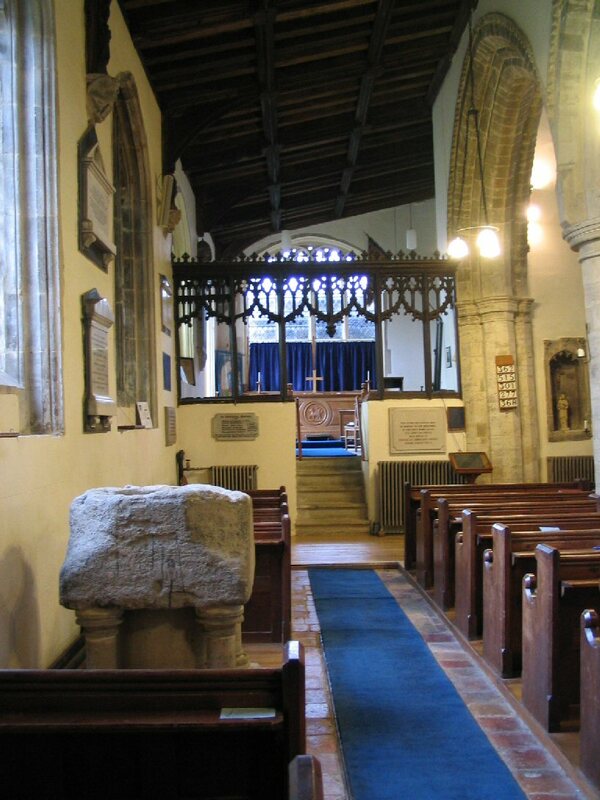 The font, which had been used as a cattle trough in Little Stukely, is possibly Saxon, and stands on a stone plinth with a central column and four columns supporting the corners. It was erected in the church in1918. 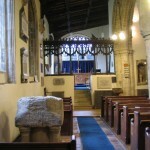 In 2004 the font was moved from the south west corner of the church to the north aisle. In 2006 a memorial was erected to Edward Maria Wingfield, of Stonely Priory, Founder and First President of Jamestown, Virginia. 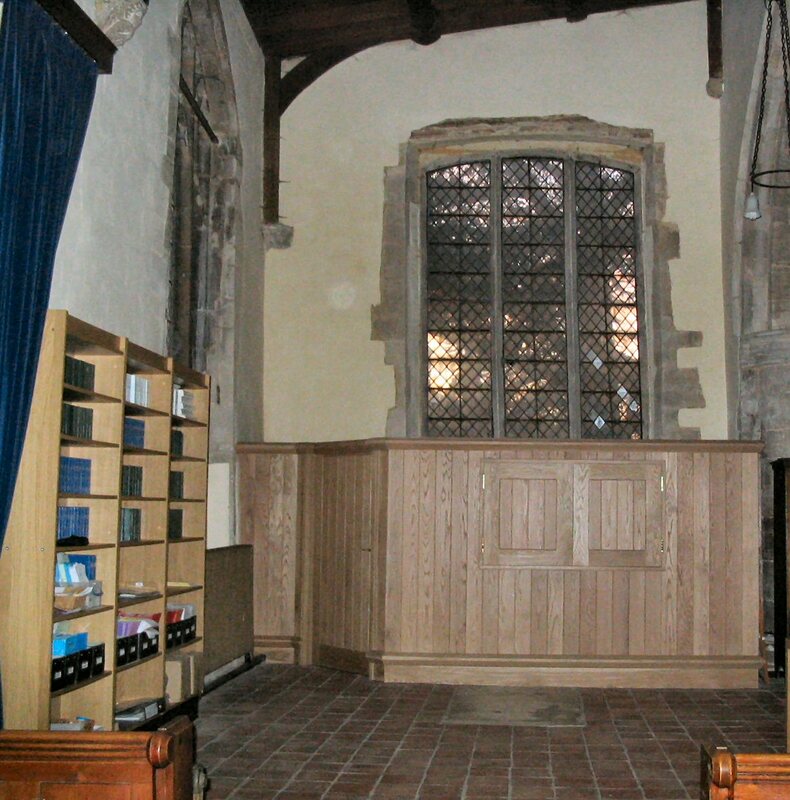 Built about 1500, this was possibly the chapel of St Katherine, mentioned in 1501.The late 15thC oak screen at the entrance has been greatly altered and restored. The floor was raised to its present height, about 1 metre [3ft.] above the rest of the church, when the Montagu vault was extended in 1853. 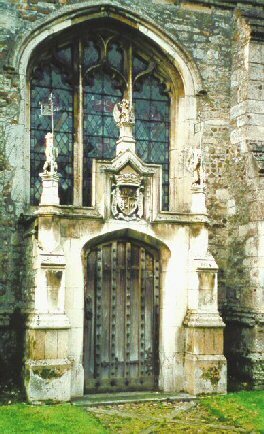 A handsome doorway surmounted by heraldic beasts, added 40 years later, provides access to the vault from the churchyard. Attached to the north window is a 17thC crest of the Montagu family with acanthus leaves. The chapel, which formally contained pews facing south for the castle servants and estate workers, was refurbished in 1963 in memory of Phyllis Vernon Kilby. Added in 1847, in a Gothic style loosely based on that of the rest of the church. 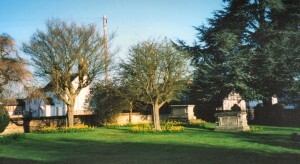 There are several box tombs in the churchyard. Burials in the churchyard ceased in 1858. After this date burials took place in the cemetery sited approx 800yds north of the church.